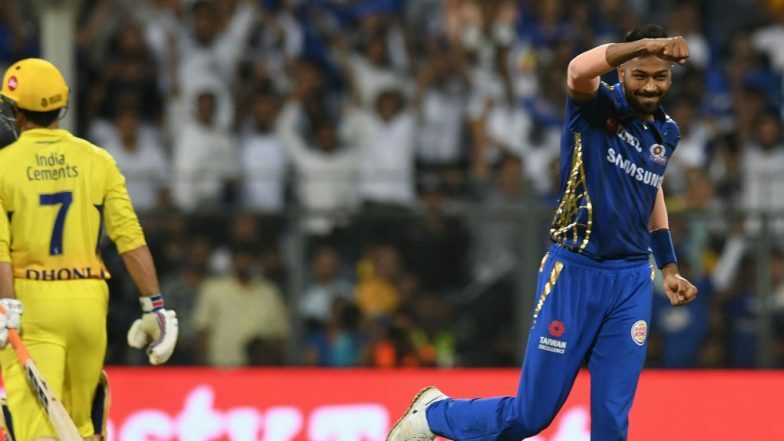 Hardik Pandya shined first with the bat and then with the ball to help Mumbai Indians (MI) to win in the crucial contest against Chennai Super Kings (CSK) in the Indian Premier League 2019 at the Wankhede Stadium, Mumbai. Hardik Pandya smashed 25 off just eight deliveries to power Mumbai Indians to a fighting total of 175 in 20 overs. MI vs CSK Live Cricket Score Updates IPL 2019. 88 runs were scored in the last six overs, thanks to the batting display by Kieron Pollard and Hardik Pandya, after Suryakumar Yadav scored an important half-century. Mumbai Indians vs Chennai Super Kings Live Cricket Score 15th T20 Match. Hardik Pandya has been the talk of the town after his blistering knock and economical bowling. Twitter has gone into an overmode post Pandya's all-round performance. Several memes were shared on the social media hailing Hardik's performance. MS Dhoni Gets Rousing Welcome at Wankhede Stadium As He Comes Out to Bat During MI vs CSK IPL 2019 Match, Watch Video. Finally a good Rapid Fire for Hardik Pandya. Hardik Pandya was adjudged the Man of the Match (MoM) for his outstanding performance against the Chennai Super Kings. Malinga's spell and Hardik's important breakthroughs broke the winning streak of CSK in this season of the Indian Premier League. CSK faced its first defeat in the four matches it has played so far in this tournament and Mumbai fetched its second victory of the season.